Scottish devolution and questions about free speech have prompted a resurgence of one of our oldest ethical debates. Naively, given that it is such a delicate issue, I had thought that the abortion debate was over in the UK, or at least that it had reached a sort of plateau. Opposition voices have not come close to making any serious changes to the Abortion Act since it was amended in 1990 to reduce the time limit to 24 weeks. But according to the British Pregnancy Advisory Service (BPAS), there has been a surge in the amount of anti-abortion activism taking place outside clinics. 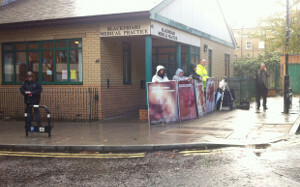 Women attempting to discreetly access a lawful health service are regularly subjected to placards showing pictures of dismembered foetuses, or lists of misleading information about abortion. Many women have reported being followed and bombarded with questions as they enter or leave the clinic, and protesters have used tripod-mounted cameras to threaten and intimidate women. Today, a video showing a pregnant woman angrily criticising protestors outside a London clinic has gone viral. The problem is such that the BPAS have called for ‘buffer zones’ to be put in place around abortion clinics. “What’s interesting about this debate is that it is starting to resemble the battle over abortion rights in the United States. Last month Bernadette Smyth, founder of the Northern Irish pro-life group Precious Life, was found guilty of harassing the director of the Marie Stopes clinic in Belfast, in what the judge called a ‘vicious and malicious’ campaign. Smyth’s case is interesting because it represents one strand of the contemporary abortion debate in British media, the question of what constitutes an infringement of free speech in this highly emotive area. Pro-life groups have expressed ‘concern’ that Smyth’s freedom of expression has been curtailed, but it is not an offence to free speech to stop somebody from harassing, bullying and threatening somebody else. Protesters outside clinics are not there to debate; they are there to judge and intimidate. Pertinently, their actions are not effective – this kind of campaign is not going to get the law changed, and the protesters know it. That is not why they are there. People have every right to campaign for a change in abortion law – even to campaign based on extremist views. They have representatives in parliament – debate can, and should, take place through these proper channels. The Oxford University debate that was cancelled last month was a proper channel. Two opposing viewpoints were being expressed – what other way is there to discuss serious ethical issues? Perhaps it was a poor decision by the OSFL to have two male speakers, but we have to allow for debates such as this, precisely to ensure that people who harass pregnant women cannot legitimately say that pro-life activism is being silenced. Revoking the platform for the Oxford debate sent the message that there is no difference between discussion and bullying, playing right into the hands of people like Bernadette Smyth. The second way that abortion has been debated recently is in relation to Scottish devolution. Earlier this week Labour MP Maria Eagle hit out at suggestions that the power to change abortion laws could be devolved to Holyrood. She objected especially, she said, to ‘a bunch of men’ deciding what women could do with their bodies. It is worth noting here that the fact men get to make the decisions on abortion is symptomatic of a wider gender imbalance in politics and the media. The students who cancelled the Oxford debate made it seem as if men were being especially consulted ahead of women on only this issue, which is not the case. Politicians with the power to make these decisions are men simply because there are more men in politics. This needs to be addressed separately. The issue has highlighted the fact that Scotland has a much stronger religious presence than England and Wales, prompting fears among pro-choice activists that devolution could mean constricted abortion laws. In 2008 the SNP gave into the Catholic Church’s opposition to the HPV vaccine for girls – the Church opposed it on the grounds that it promoted promiscuity. Tighter abortion laws in Scotland could lead to a rise in what has been dubbed ‘abortion tourism’. The UK Department of Health released statistics that showed that between 1980 and 2008, at least 137,618 women travelled from Ireland – where abortion is illegal – for abortion services in England and Wales. The Irish Family Planning Institute (IFPA) underlines that these numbers are an underestimation ‘as not all women resident in the Republic of Ireland will provide their Irish address for reasons of confidentiality’. It probably does not need repeating that women will always seek to have abortions, and tightening constrictions simply puts them at risk of unsafe procedures. It is interesting to note that the government continues to turn a blind eye to the abortion question in Northern Ireland, the only part of the UK that did not accept the 1967 Abortion Act. The laws covering abortion in Northern Ireland are the 1861 Offences against the Person Act, and the Criminal Justice act from 1945. Although the law allows for medical exceptions, the Department of Health in Northern Ireland has persistently failed to provide proper clarification on this, perhaps contributing to the amount of protest outside the Belfast clinic. Health minister Jim Wells recently proposed ten year jail sentences for women who have abortions. A November survey of delegates at the Social Democratic and Labour Party conference found that 54 per cent of those questioned would support a relaxation of the laws in Northern Ireland. But there has been little action to further the discussion, except from hardliners seeking to keep the law, or even make it stricter. The recent debate in parliament has not considered Northern Ireland, the part of the UK where women are most affected by abortion legislation. Before worrying about what Scotland would hypothetically do about abortion, politicians should pay attention to the ongoing distress and risk that thousands of women within the UK are already facing. I think the Northern Ireland and ROI abortion laws are well balanced. They give a woman the right to save their own life if (in the very rare instance) the pregnancy is threatening her life. It does not, however, give woman a “right” to kill their unborn baby for practically any reason. In the first case, the right to life of the mother and right to life of the unborn baby is balanced ; in other cases of abortion, it is not, and the baby’s right to life should outweigh a mother’s so-called “right to control her own body” (ie her baby’s body) or whatever feminists call it. The debate over abortion in Scotland is ridiculous, if the Smith Commission was nothing else, it was an opportunity for unionists – Labour in particular – to prove their commitment to devolution by relinquishing their hold on powers previously considered too important to fall within the Scottish Parliament’s remit. Unsurprisingly, they declined it. The main point of devolving abortion law was not so that Scotland could use it to increase or lower the limit (something inconceivable under Nicola Sturgeon’s leadership) – it was simply to prove that Scots were trusted enough to be able to decide for themselves what that limit should be if they so chose. And the unionist parties view is plainly that they’re not. A revision of Margo McDonald’s Assisted Suicide Bill is currently being considered in the Scottish Parliament. This means Scotland is in the bizarre situation of being allowed to decide whether an adult human being can be euthanised, but not whether a foetus can be aborted. If that bill gets passed, it would mean doctors north of the border would be allowed to assist suicide, but not south of the border – the very situation Labour claims to be behind their refusal to allow abortion law to be devolved. Women having to cross the border to get an abortion, then, is unacceptable (unless it’s from Northern Ireland, where UK citizens have only very restricted rights to terminations), but a Parkinson’s sufferer from Cornwall having to make their way north to die in dignity at the hands of an unknown doctor would be totally fine. Labour claim to be concerned that Brian Souter’s supposed influence over the SNP would lead to a more conservative abortion limit, yet Souter – who was far more active in opposing gay rights than abortion – failed to exert any such influence to prevent the SNP from passing one of the most progressive equal marriage laws in the world. Labour’s message to Scotland is clear: they’ll decide which issues we’re responsible enough to have control over (which is precisely why further devolution is always decided through unionist-led commissions, rather than giving Scots a direct say). It’s a message that strikes at the very heart of the attitude taken to both the Calman and Smith Commissions, namely that Scotland needs to justify why it should have control over powers rather than Westminster having to justify keeping them. You can’t prevent democracy from fear of what will change – that’s what democracy is! There’s no reason Scotland can’t manage its own abortion laws. On a different point, we DON’T, in this country, have the right to debate extremist views whether in person or online. The government is using the current alert status and hastily rushed through laws to silence “dangerous extremists”. But who are the extremists? So in the end, you get women having backstreet abortions. How does that help, again? Your attitude is that you’re a different country, basically, and that the British peons should explain why you don’t get to have your way.